A Jumbo Combo for four. 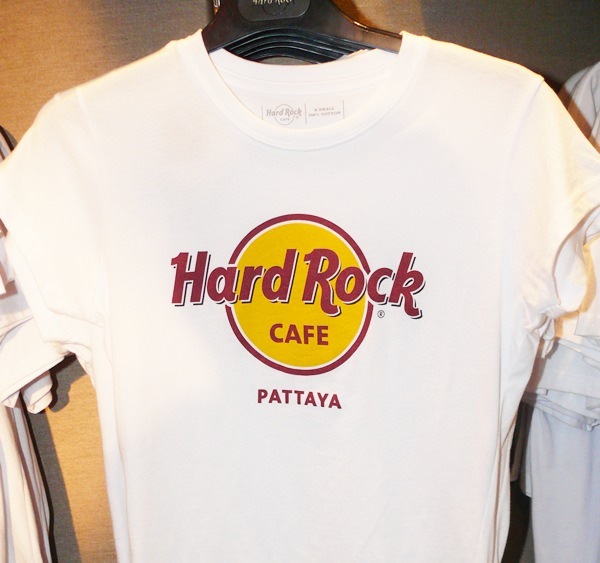 On Beach Road, beside a very large guitar neck, is the Hard Rock Cafe, Pattaya. The Hard Rock Cafe concept is a chain of themed restaurants founded in 1971 by Isaac Tigrett and Peter Morton in London. In 1979, the cafe began covering its walls with rock and roll memorabilia, a tradition which expanded to others in the chain, including Pattaya. Our Hard Rock Cafe follows the tradition and displayed on the walls are guitars, stage outfits and even a pair of sneakers and other memorabilia, all of which are changed every ten years, I was informed by Totti the restaurant manager. With our Hard Rock Cafe which opened in October 2001, a new batch must be coming soon. This is a ‘small’ 6 oz burger. We were welcomed at the door and with no nuclear war-heads to declare and with Guns n Roses on the flat screen TV’s, we were taken to our table. Two outstanding features separate this restaurant are the long bar along one wall and an elevated full rock band dais on the opposing wall. The third (glass) wall cuts off the kitchen. We were taken through the menu by Khwan (Marcom manager) and Ken Goessens (Kitchen manager). The menu itself, colorful and photographic, is the best menu I have seen in Pattaya. You know exactly what you are getting as your order. We discussed the different dishes with our enthusiastic “guides” and decided to order dishes which were new or different on the menu. We were a group of four so the adults chose the Australian chardonnay (served at the correct temperature), and the younger members of the team could find some exciting non-alcoholic mocktails to keep them occupied. Beers are B. 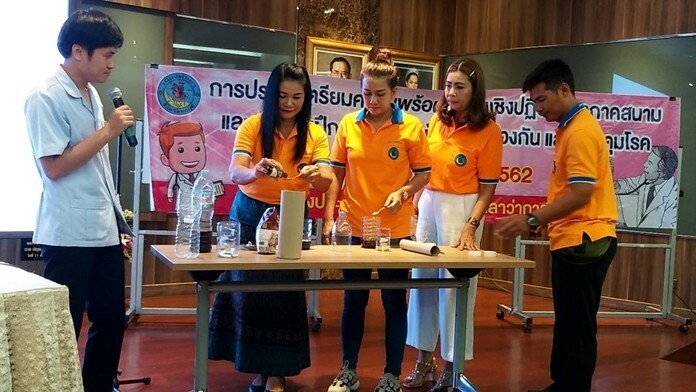 199 and wines are around 2,000 baht a bottle. I should also mention at the outset that most dishes are so big they need to be shared, with an 8 ounce burger being enormous, and even the 6 ouncer is a lot of beef. When you then look at the prices, what seemed to be expensive is not when shared between two or three people. The Jumbo Combo feeds four (well it did for us) making it under 200 baht per head. 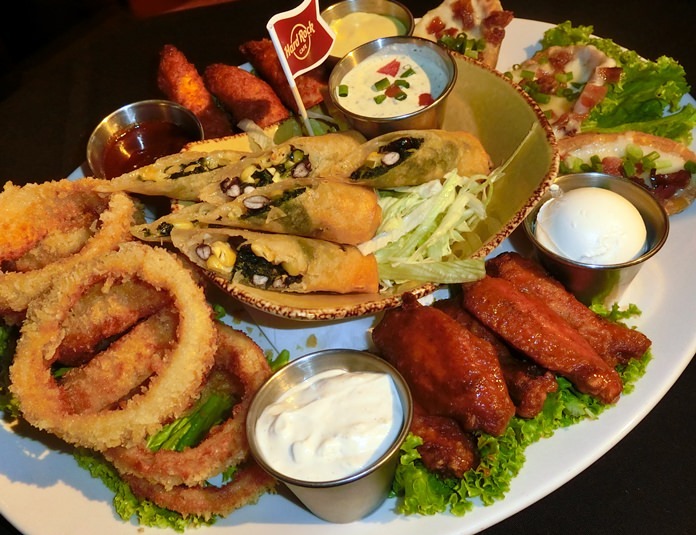 The menu is divided into sections, with the first being starters which covers flat breads and nachos (B. 300-400). Entrees are next with several different fajitas and a cod and chips (B. 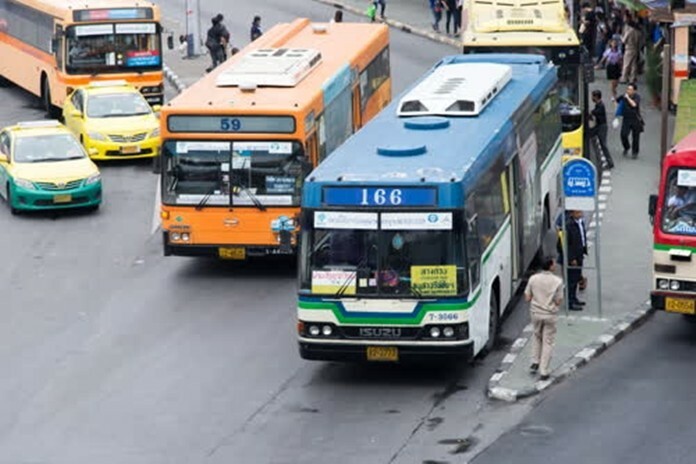 499). The Cafe does their own smoking in house with a half rack ribs at B. 449. There is one section called Asian inspired with Tom Yum Goong (B. 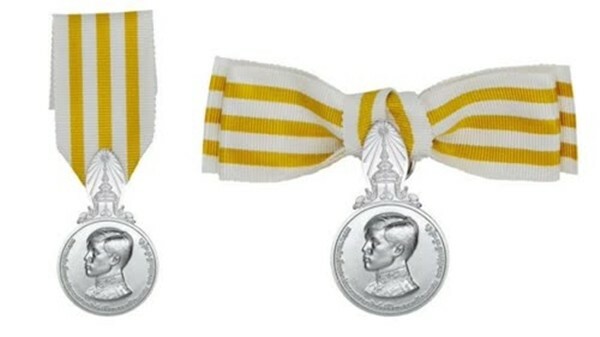 419). So here we go. We began with the Jumbo Combo. Brilliant beginning. The next dish was a flatbread with grilled chicken, pico de gallo, roasted red peppers, green onion, avocado, mozzarella and spicy jalapeno sauce. Our next was a huge plate of nachos tortilla chips piled high and layered with three bean mix, Monterey Jack and cheddar cheeses, pico de gallo, jalapenos and green onions, served with grilled salsa. Garnished with sour cream. 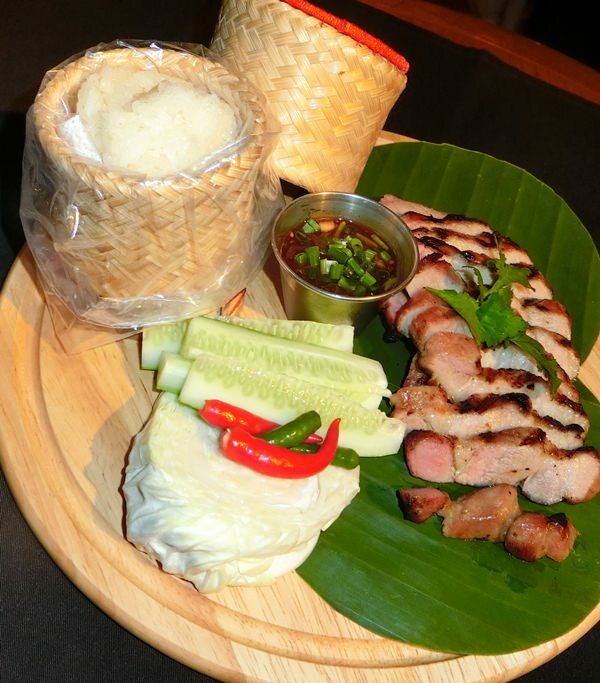 One of the Thai dishes complete with sticky rice. 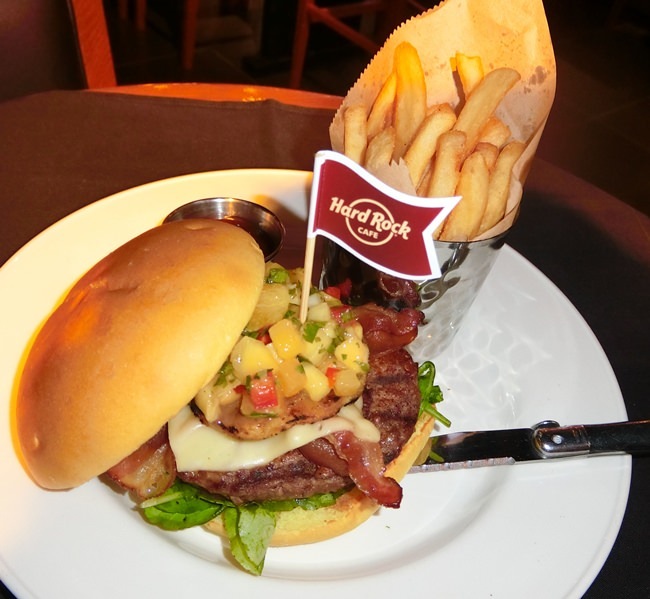 We had to try a burger and chose a 6 oz Tropical Burger – basted with chipotle pepper, topped with BBQ glaze, Cajun bacon, cheddar cheese, grilled pineapple and mango salsa with arugula, served with BBQ glaze. If we had the 8 oz we would have been there all night. Eventually we finished off with a hot fudge brownie – vanilla ice cream and hot fudge on a dense chocolate brownie, topped with chopped walnuts, chocolate sprinkles, fresh whipped cream and cherry. Staff checking for a nuclear bomb? The band comes on at 9 p.m. and they will even play rockin’ requests. A great night’s entertainment. Don’t miss the Hard Rock Cafe. 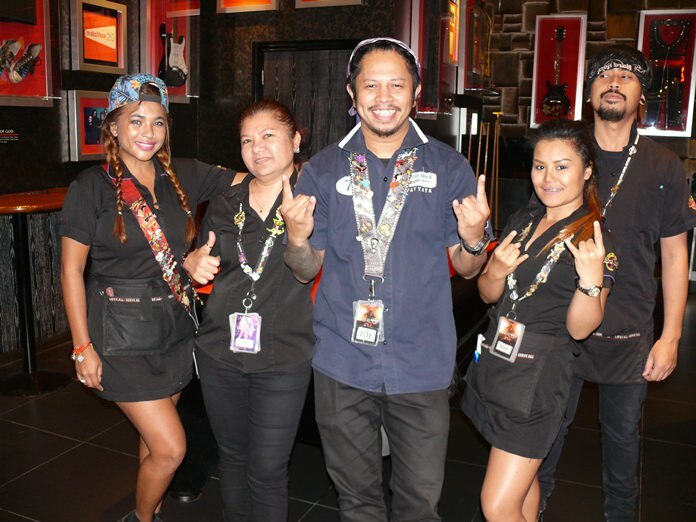 Hard Rock Cafe, 429 Moo 9, Pattaya Beach Road, telephone 038 428 755 through to 9, Parking streetside or in the hotel grounds, open 12 noon to 1 a.m. weekdays and 12 noon to 1.30 a.m. weekends.